My boys love sharing little "treats" with their friends and classmates on special occasions, and St. Patrick's Day is no exception. One of our favorite gifts to share on March 17 is Leprechaun Bait. 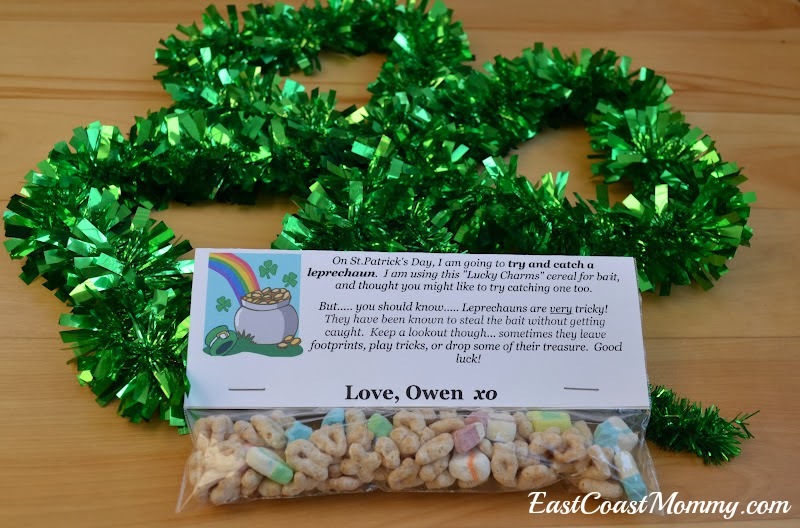 To make Magic Leprechaun Bait, just fill little bags with "Lucky Charms" cereal, and attach a cute little note. (Click here for a "pdf" version of the one I designed. There are two on a page, and they can be cut to fit on top of a snack/sandwich baggie.) Easy, right? On St.Patrick's Day, I am going to try and catch a leprechaun. I am using this "Lucky Charms" cereal for bait, and thought you might like to try catching one too. But..... you should know..... Leprechauns are very tricky! They have been known to steal the bait without getting caught. Keep a lookout though... sometimes they leave footprints, play tricks, or drop some of their treasure. Good luck! In the morning, we didn't find a Leprechaun, but we did find some shiny pennies and gold bars (Caramilk bars). This idea is simple and fun, and I guarantee the kids will love it! Let me know if you catch one. ** If you haven't already "liked" me on facebook, I would love to have you join me here. Super cute idea! Love the box! I bet the kids had a blast decorating that!! So so cute! Had to "pin" it. Love this idea. So creative! This takes me back to my student teaching days. My master teacher and I did it with our second grade class. It was great fun! I hope I remember to do it with my own kids this year. I think they would love it! This is so cute! Stopping by from the COM linky party. I love St. Pat's Day and I am trying to get the kids involved. This idea will be so much fun. Thanks for sharing! We love St.Patrick's Day too. We also do green milk, shamrock pancakes for breakfast, and St.Patrick's Day cupcakes! :-) What's not to like??? What a wonderful idea!! I'm sure the kids love it. Thank you for sharing at Sharing Saturday!! I hope you will share with us again this week! Such a cute idea! Thank you so much for sharing. I'll be borrowing this for my daughter's daycare. I'm following. Stop by www.thenymelrosefamily.blogspot.com any time. Wow, what a fun idea for kids. I don't have any young ones at home, but if I did, I'd certainly do this for them. we do something very similar - my kiddos love building their traps! The leprechaun usually leaves a box of Lucky Charms! OMG this would be ssssoooo fun! I LOVE it! Thanks for sharing! What a fun idea! The kids will absolutely love this! I would love it if you would come link up with Busy Monday (open Monday through Thursdays) at A Pinch of Joy, a linky party for ideas that make life better, easier and more fun! This is sooo cute!! Thanks for sharing!! Very cute! Saw your link from the Kids Co-Op linky and had to come see! Such a sweet idea to do with the kids! I'm sure they had a great time trying to catch the Leprechaun! Thanks for sharing! I love the bait and trap so much FUN! Thanks for sharing your leprecaun trap! The links for Busy Monday at A Pinch of Joy are open for this week's party! I hope you will bring another project to link!!! So fun! I'm sure your kids will love this. Hi! How did you get Owen's name on the leprechaun food note? Great post(s) Gina! You've got so many great ideas for St. Patrick's day! I first came here to comment about 'Catching a Leprechaun' because I linked it to my own St. Patrick's Day post, then saw all of your other ones. The idea of setting of traps for a leprechaun just cracks me up. It's so appealing to kids. My 37 year-old brother set traps for the tooth fairy and encouraged our kids to do the same. Hilarious. yesterday we read two of our favourite st. pats day books the leprchaun who lost his rainbow and Leperchaun on the loose thats about a boy who gets in trouble after a leperchaun cause all sorts of trouble in his class he builds a leperchan trap to prove to everyone he wasnt lying about the lepercaun and save the day. we made leperchaun traps and used mini cheerieos doughnuts decorated with cookie writer markers as bait we also played find the pot of gold hidden in the house the kids loved it and had to play it two more times. were hoping to catch one.